This article isn't for people with slight low back pain--like you can "kind of" feel it when you sit down or get up. This article is written for people are in a great deal of pain. The kind that has you worry about the ability to get off the toilet. The kind that makes you worried that you'll never get any better. Bad. That kind. Know that this is known as an "Acute Episode." 100% of people will experience them. The vast majority of the time, they are short-lived and infrequent but painful and scary nonetheless. About 4 years ago I got a stomach bug that wiped me out for about a week and a half. It was awful. I couldn't go to the bathroom that whole time. I was alternating all my time between writhing on the couch and sitting, ineffectively, on the toilet. I knew something was really wrong. I went online and read WebMD and found that I might have an intestinal blockage which would require immediate emergency surgery. I considered maybe I had diverticulitis with painful out pouching of the intestines that would also require major intervention. Finally, after a week of misery and WebMD-induced anxiety, I broke down and went to Urgent Care. What did she diagnose me with? Constipation. What did she recommend I do? Eat crackers and drink ginger ale. After questioning her about the severity of my symptoms, what did she say? "This too shall pass......."
What was the lesson that I needed to be reminded of? We tend to fear the worst and catastrophize when we're in unfamiliar pain. It's completely normal. 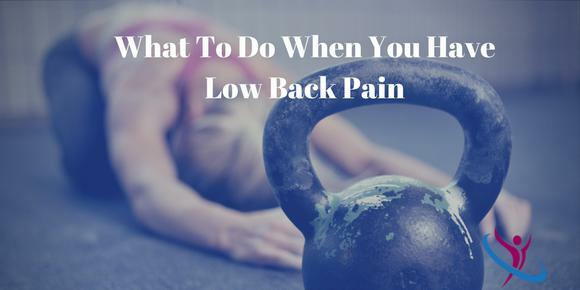 As human beings it's very normal to think that when you're in pain that there must be some visible physical cause that would be apparent by getting imaging of your low back. For some reason, we also need proof that something is causing this pain. Unfortunately, when it comes to back pain this type of thinking isn't really helpful. All pain in the body is caused by chemical inflammation that creates the emotion of pain in the brain. (THAT'S RIGHT--I said chemicals and emotion even though it feels 100% physical). Now, I'm not telling you that you're pain is in your head. What I am saying, is that the complex phenomena that is Low Back Pain can't always be found and described by imaging your low back. In fact, it's quite the opposite. Medical studies are now showing that early MRI is associated with WORSE outcomes in chronic Low Back Pain and disability (Graves, 2012). Why? I suggest, that when you can visualize an abnormality in your back there is a psychosomatic effect that propagates the emotional cycle of back pain, whether that abnormality actually causes your Low Back Pain in the first place or not. Did that make sense? 1) Don't be so quick to want to take an X-Ray or MRI. It's expensive and it probably won't change the outcomes of your Low Back Pain episode anyway. b. You've attempted a course of conservative management (chiropractic, physical therapy, etc) and haven't gotten good results after approximately 1 month. It's not always smooth sailing. Sometime you'll feel worse after a visit. It's okay and doesn't mean something is wrong or not working. Stay the course. Typically it doesn't involve specific movement that increases pain. So if you find yourself saying something like, "It hurts when I stand up from a seated position," then that wouldn't typically indicate a tumor as the cause. In the absence of a traumatic event, fractured bones causing back pain is very rare. The vast majority of these incidents are episode that will pass with the right action. But sometimes it doesn't. When is it your time to panic and start seeking medical care? A general rule of thumb is if you are at 10/10 pain for more than a week and you don't feel like anything is improving, then it's time to seek out professional care. One week of 10/10 pain is too long to be dealing with this. Fusion - the spinal segments are fused to stabilize the affected area. Since the spine is designed to move, this spells trouble down the road for the segments above and below the fused area. Laminectomy - the back side of the vertebrae are removed in an attempt to decompress any pinched tissues. Disc Replacement - artificial discs are placed in the place of the injured segment. Microdiscectomy - the most modern and least invasive option we've seen lately. It involved cutting out the 'herniated' aspect of the disc. What If I Have a Herniated Disc? Sometimes people treat a herniated disc like the kiss of death. All the time patients come into my office saying, "I herniated a few discs 20 years ago and I still deal with it." Well that's not necessarily true. Disc injuries can heal through proper physical rehabilitation, chiropractic, physical therapy, exercise, etc. Far too many people think that when you have a herniated disc that you need to have surgery. In my experience, for the majority of cases there are better, more conservative options that are successful. 2) A bad bulge/herniation/sequester can lead to a pinched nerve that could possibly, if they're bad enough, lead to surgery. But the majority of them don't. Again, proper conservative care through a chiropractor/physical therapist/physical medicine MD, etc can adequately treat the majority of disc injury cases. Good luck!!!!! (1) Delitto, A. "Surgery Versus Nonsurgical Treatment of Lumbar Spinal Stenosis: A Randomized Trial Surgery Versus Nonsurgical Treatment of Lumbar Spinal Stenosis." Journal Ann Intern Med. 2015;162(7):465-473. Doi:10.7326/M14-1420, n.d. Web. 20 July 2016. (2) Chiu, CC and Chuang, TY. "The Probability of Spontaneous Regression of Lumbar Herniated Disc: A Systematic Review." Clinical Rehabilitation 29.2 (2014): 184-95. Print. (3) Graves, JM and Fulton-Kehoe, D. "Early Imaging for Acute Low Back Pain." Spine. 37.18 (2012): 1617-627. Web.